When you Google “Amazon fires,” the first thing you encounter is a tablet device. But in the coming months, if scientific forecasts prove correct, that may change. That would be disastrous for the Earth’s climate overall. The Amazon alone stores an enormous amount of carbon, 120 billion tons worth. Put that stuff in the atmosphere and the result would be justly termed catastrophic. Amazon fire seasons don’t just happen — the rain forest doesn’t just burn in a massive way on its own. But logging, slash-and-burn agriculture and other human-induced changes have altered the landscape. Thinning out the forest also dries it out — the forest canopy then cannot block sunlight, and the understory and ground leaf layer become hotter and drier. Then, the trees are more flammable and fires can also spread more easily. But it’s really the consequences of those fires in drought years that have scientists worried. First, a bad drought and fire year could deliver a great deal of carbon to the atmosphere, worsening global warming. The 2005 drought, a later study found, contributed between 1.2 and 1.6 gigatons (or billion tons) of carbon to the atmosphere. That corresponds to between 4.4 and 5.87 billion tons of carbon dioxide, with the upper end about on par with what the entire United States emits in a year. “Amazon forests … appear vulnerable to increasing moisture stress, with the potential for large carbon losses to exert feedback on climate change,” the study concluded. But an even deeper fear is that extreme fires could transform the Amazon itself, and that carbon loss is just one indicator of that. The idea of Amazon “dieback” — that the forest could dry out, store less carbon, and produce less rainfall as the climate warms in a devastating feedback cycle — has long circulated in scientific circles. And while it is far from clear how soon it could occur, it definitely continues to worry researchers studying the system. 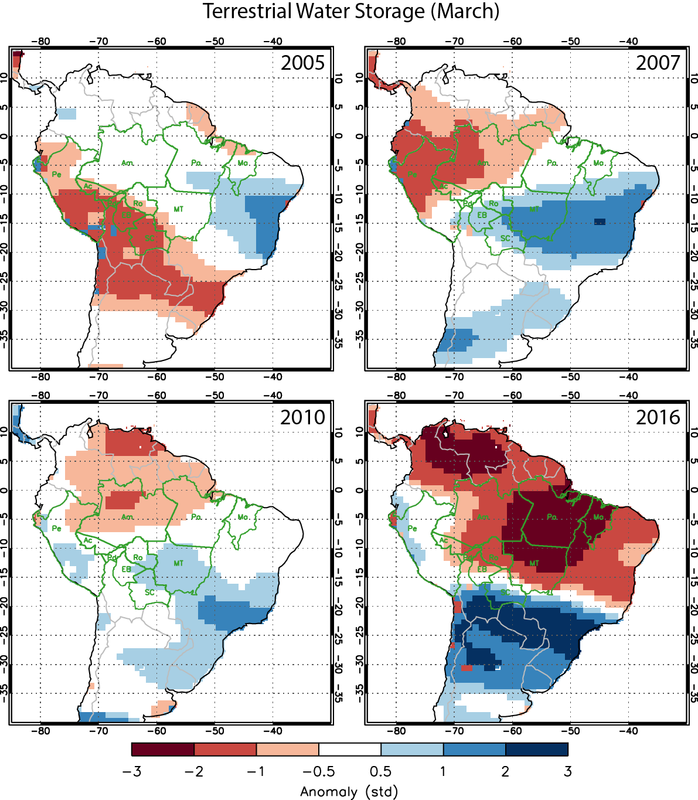 There is published research suggesting the southern Amazon dry season is already getting longer in a warming world. There’s also research suggesting that fires during drought years, in interaction with the way that humans have already changed the landscape, could play a key role in transforming the Amazon into a less dense forest and more fire-prone state. The Woods Hole Research Center’s Brando, and his colleague Marcia Macedo, were part of a team of scientists who produced a 2014 study reporting on how drought conditions in 2007 affected southeastern Amazon fires and, subsequently, the regrowth of the forest. They found truly dramatic effects on dried-out trees, noting not only that the trees burned and died at far higher rates in hot and dry conditions, but also that the landscape changed afterward to support less dense forests but also more flammable grasses. Perhaps worst of all was how the drought interacted with the ways humans had already changed the forest, by chopping down trees and thus creating a more fragmented forest landscape with more “edges” that are exposed to sunlight from all directions, and so hotter and more dried out. The study found some of the worst fires in fragmented areas — showing that in effect, humans have weakened the system by chopping down trees, and then droughts and fires come along and make it all worse in a kind of one-two punch. That’s the good news. The bad news is that scientists continue to talk about the Amazon in the same way they talk about, say, West Antarctica or the overturning circulation of the Atlantic Ocean — as a delicate system that we could tip, with enormous consequences.